Estate Planning Bits: Who will care for your pets when you can’t? Who will care for your pets when you can’t? "Many have forgotten this truth, but you must not forget it. You become responsible forever for what you have tamed.” Antoine de Saint-Exupery stated this in The Little Prince. Most people consider their pets to be members of their family, while others go to more extremes, yet the fact is there is a strong bond between pets and their owners. It has been said that 80% of pet owners brag about their pets to others, 79% allow their pets to sleep in bed with them, and 37% carry photos of their pets in their wallets. It is evident that there is an indescribable love between pets and their owners. A common issue that arises is, what happens to pets if the owner passes away or becomes sick and can no longer care for his or her pets? If you passed away and did not have an estate plan for your pet, often they are euthanized, neglected or abandoned. To prevent these outcomes from happening, an estate plan is created, which provides for the proper care and love for your pet. Legally, an animal is considered tangible personal property, like your car, furniture, jewelry, and would pass down to heirs or beneficiaries of your estate who are entitled to your personal property. Your pet can be cared for through an estate or a trust. 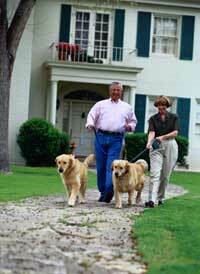 The first step in planning for the estate of your pet is to select a caretaker. A caretaker is usually a person or organization that can provide for your pet when you no longer can. The process of selecting a caretaker can be challenging. When selecting one, you want to communicate your expectations and needs of the pet, you should allow the potential caretaker to spend time with your pet, and you should discuss any type of reimbursement or compensation. You should compile information about your pet such as identification, detailed instructions for care needs, veterinary information, and legal documents. Based on the circumstances, you may want to set aside caretaking funds necessary to cover expenses for your pet. An organization may also be a caretaker for your pet. A “pet trust” is an arrangement whereby the caretaker’s right to receive any caretaking funds is limited. The term “pet trust” can include three different types of arrangements: honorary trusts, statutory pet trusts, and traditional legal trusts. An honorary trust is a trust for the benefit of the pet. The caretaker may either honor the terms of the trust by using the funds or relinquish the funds to the beneficiary. An issue that arises is the remainder beneficiary is the only party that can enforce the honorary trust. A statutory pet trust allows virtually any third party to compel the caretaker-trustee to use designated caretaking funds solely for the benefit of your pet. While a pet trust offers a level of protection, there are limitations as well. The court is allowed to reduce the amount of caretaking funds to what it sees reasonable. A traditional legal trust can be established for your pet, which allows more flexibility than the other alternatives. Pet trusts tend to be costly due to the fact that there is an attorney fee, annual administrative costs, and costs to cover care for the animal. There are a dozen or so states that allow pets to be named as beneficiaries of trusts, and enforce the trust with someone acting on the pet’s behalf. Besides estate documents, animal cards should be made. An animal card is a document that contains information about the animal and contact information for the party who has custody of the animal. Animal instruction documents contain the same information as the animal card, as well as the animal’s medical history and contact information for the veterinarian. Start planning your pet estate so your furry, fluffy companions will be in good hands.